Which Parts of the Nose Can Rhinoplasty Address? If you are thinking about undergoing rhinoplasty – sometimes referred to as a nose job – you probably already know that the procedure can help improve the aesthetics and/or functional integrity of the nose. The question you may have now is which particular areas of the nose can be addressed during surgery? Below, I’ve listed the various parts of the nose that can be refined with rhinoplasty, as well as the specific enhancements that can be made to each based on your unique concerns and goals. Nostrils – The nostrils can be reshaped to improve symmetry, achieve a better proportion in relation to the rest of the nose, and/or facilitate nasal breathing. 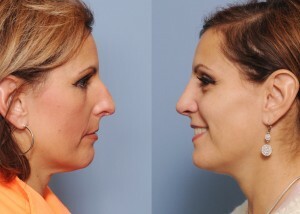 Nasal Bridge – To help enhance facial harmony, the nasal bridge can be straightened, thinned/augmented, or diminished/enlarged in size. Nasal Tip – The nasal tip can be increased or decreased in size, and its contour can be broadened or narrowed. Additionally, the tip can be raised or lowered based on the patient’s desires. Septum – A deviated septum can be repaired/realigned to help improve nasal breathing. Nasal Hump – A nasal hump or bump can be trimmed or shaved down to smooth and refine the nasal profile or side view. In the end, the rhinoplasty procedure can be individualized to address the cosmetic and/or functional issues you may have with your nose. To ensure this is done properly, however, it is imperative that you consult with a Fellowship-trained facial plastic surgeon who has significant experience with numerous aesthetic and reconstructive rhinoplasty cases. For more information about rhinoplasty, or if you are interested in scheduling a consultation with Dr. Shadfar, please feel free to contact us today.